Perhaps it’s a bit late in the season for a post on strawberries, but as a person who grew up in a town that used to bill itself as “The Strawberry Capital of the World,” I’m pretty much obligated to make note of their appearance. We’ve enjoyed plenty of strawberries at my house this year; one might say that we’ve enjoyed more than plenty. Between my frequent visits to The Market at Blooming Colors to purchase gallons at a time and the steady supply coming each week from our C.S.A., we’ve had strawberries in the refrigerator consistently since early May. I made a few small batches of jam, but mostly we’ve eaten them at out of hand. Is there a better way, I wonder? Well … maybe. Strawberry season in Ponchatoula has always a big deal. To accommodate the kids who lived on strawberry farms, my highschool’s spring break lasted for nearly a month, meaning that we attended classes well into June to make up for the lost days. This continued until 1985, the year I graduated, when a new school was built to accommodate the increasing numbers of students. Less prosaically, William Faulkner refers to the town’s strawberries in The Wild Palms. Walker Percy, who lived for a time in nearby Covington, mentions it in one of his novels, but I can’t remember which one. 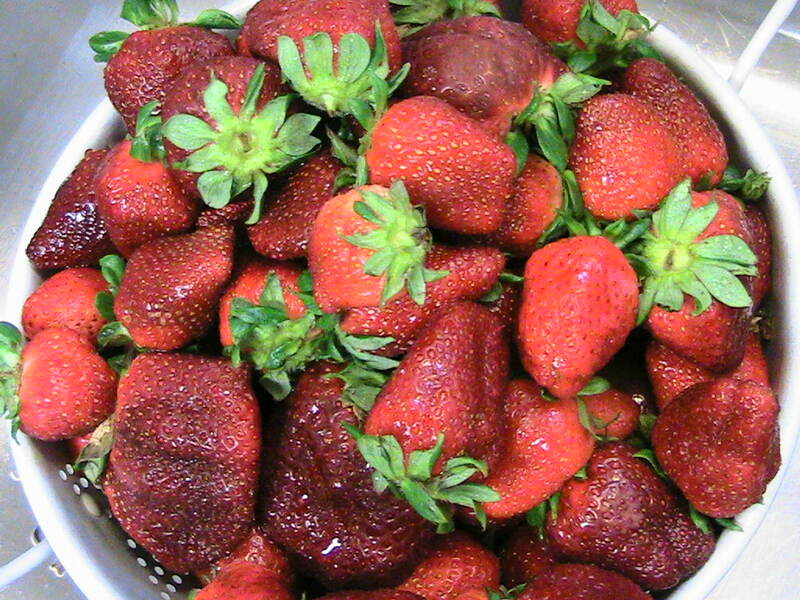 A flat of “Ponchatoula strawberries” used to be considered a delicacy, something truly special. Years ago, farmers used to truck their berries into New Orleans to sell flats on Canal Street for astronomical sums. To cheat the system, my grandmother made more frequent visits to our home during berry season on the pretense of “visiting her grandchildren.” She fooled no one; the back seat of her car sometimes contained as many as three flats of berries. One went to her boss, one she shared with her coworkers, the other she ate by herself, sometimes in the car on the way home. UPDATE: My mother has insisted that I let everyone know that this year’s Strawberry Festival attracted a crowd of over 100,000 people. On those rare occasions when you find yourself with plenty of strawberries — more than you can eat out of hand — this galette makes a delicious Summer dessert. It’s fancy enough for company, but won’t keep you in the hot kitchen for very long at all. Blackberries and blueberries make fine substitutes — just make sure to use the appropriate flavor of jam. Dough: In a food processor, combine flour, sugar, cornmeal and salt; pulse 3-4 times. Add butter and pulse until mixture resembles coarse crumbs. While the processor is running, slowly drizzle buttermilk into the crumbs. Process until dough comes together to form a ball. Remove dough from processor and form ball, incorporating any stray crumbs. Wrap in plastic wrap and refrigerate for about an hour. Galette: Place rack in center of oven and preheat oven to 350°F. Line baking sheet with parchment paper. Remove dough from refrigerator and place on parchment-lined baking sheet. Roll out dough into a 14 to 15-inch wide roundish circle. You can use a pot lot as a guide, but don’t worry too much about perfection. Spread jam on top of the dough, leaving about a 11⁄2-inch border around the edges. Sprinkle cookie crumbs on top jam. Scatter berries on top of crumbs. You should have enough berries for two layers. Mix sugar, cinnamon and lemon zest together and lightly sprinkle this mixture over the berries. Gently fold edges of dough back over the strawberries. Whisk egg white and milk in a small bowl. Brush edges of dough with egg wash, and sprinkle with turbinado sugar. Bake for 45 minutes to 1 hour, or until crust is golden brown and filling is bubbly. Transfer baking sheet to a cooling rack for about 30 minutes. If you want to be fancy, serve the cooled galette with a spoonful of whipped cream or along side a bowl vanilla ice cream. mmmm. i’m eagerly awaiting berry bliss–another few weeks here. one of my favorite recipes is a strawberry tart from la palette, a parisian cafe. a simple buttery tart shell, slicked with homemade jam, topped with fresh berries and a dollop of cream. i thought of you often while i was in paris…what a magical dream. Can’t wait to hear about Paris! We stayed right around the corner from La Palette, and watched them put out their tables and umbrellas every morning from the cafe that we frequented. Their tart is lovely. I’m so glad Dorie Greenspan provided a recipe for it in her famous tome.